Healthy fries is not an oxymoron! These BAKED garlic Parmesan potato fries are so delicious, this recipe almost seems too good to be true! You don’t have to FRY the fries to make them crispy and yummy. In fact, I don’t even own a deep fryer – the oven can do an amazing job browning and crisping the fries if you use the right technique! Dry the potatoes with the paper towel to absorb all excess moisture. This will help the baked fries be crispy, not soggy! Put the potato fries in a bowl and toss with olive oil, then toss with grated Parmesan cheese so they are evenly coated on all sides. Spread the fries on a parchment-paper-lined baking sheets in a single layer, so the fries are not touching each other. Sprinkle with salt, pepper, garlic powder and Italian seasoning. Baked in a pre-heated 425F oven to 30 minutes, or until the fries are golden-brown. Sprinkle the baked fries with remaining Parmesan cheese. There you have it – crispy, delicious and healthy oven-baked french fries! Serve these fries immediately for maximum crispness. Enjoy! 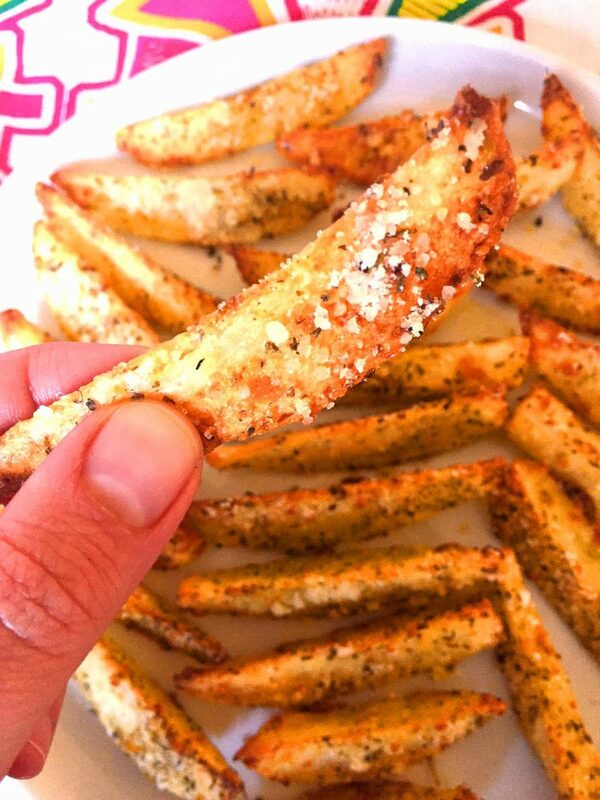 These Parmesan garlic french fries are amazing! They are so addictive, you just can't stop eating them! Best of all, they are BAKED in the oven, not fried! Yes, yummy and healthy french fries - that's a must-make! Put the dry potatoes in a bowl and pour olive oil over them. Toss with your hands so the potatoes are completely coated with olive oil on all sides. Add ¼ cup of Parmesan cheese to the potatoes, and toss with your hands so the potatoes are evenly coated with Parmesan cheese. Put the potatoes on a baking sheet in a single layer, so the fries are not touching. If there is not enough room, use another baking sheet. Sprinkle the fries with salt, pepper, garlic powder and Italian seasoning. Put the fries in the oven and bake for 30 minutes, or until golden-brown. Remove the fries from the oven and sprinkle with remaining Parmesan cheese. Serve immediately. 0 Response to "Oven Baked Garlic Parmesan Potato French Fries "